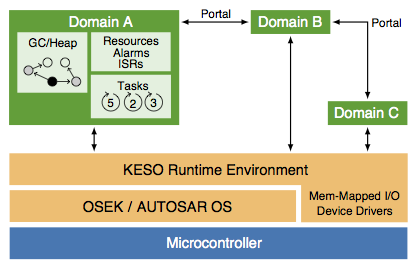 KESO is a Multi-JVM for embedded devices and networks of micro controllers. KESO builds on a standard OSEK/VDX or AUTOSAR OS operating system that provides scheduling and synchronization mechanisms to support multiple tasks on one micro controller. It furthermore provides notification mechanisms and a timer concept that allows the handling of timed or cyclic events. KESO is designed for static embedded systems. The static nature of the system enables the use of analyzing techniques that allow the creation of a system that is highly adapted to the Java applications. Because complicated mechanisms such as a dynamic loader for Java classes are not required in such a system, we can achieve code sizes that allow to run KESO on smallest embedded devices. To avoid the interpretation of bytecode on the target controllers, the Java bytecode is compiled to a native code binary image ahead of time. KESO applications are developed in Java using a uniform programming model. Memory-safety defects caused by out-of-bounds indexing, null-pointer dereferencing etc. are constructively avoided by the type-safe programming language and the KESO runtime system. There is a single configuration for the system as a whole. Subsequent configurations such as the configuration for the OSEK/VDX operating system are created automatically by jino, KESO's static analyzer and building tool. jino adopts concepts from abstract interpretation. KESO provides a concept similar to the process concept found in modern operating systems for personal computers. These units are called domains in KESO and allow the safe co-existence of multiple tasks on the same micro controller. These domains can communicate through a uniform portal mechanism that works similar to Java Remote Method Invocation (RMI) or Remote Procedure Calls (RPC). The conceptual design of KESO was inspired by the Java operating system for personal computers JX. KESO allows for software-based replication of selected (critical) applications. Replicas are spatially and temporally isolated from each other and co-located applications by domains. An application-specific majority voter picks a sane replica or triggers the state recovery of a malfunctioning component. The feature is fully automated and just needs to be activated in the system configuration. KESO has experimental support for controller networks, which allow domains to be located on different nodes while providing a global view to the application. These domains will be able to communicate via the portal mechanism just as domains that are colocated on a micro controller. Since the location of a domain is transparent to the application, a relocation or integration of tasks within the controller network will boil down to a reconfiguration that does not require a change to the applications. KESO backends are currently available and ready to use for the following platforms: JOSEK, CiAO, Trampoline OS, Elektrobit ProOSEK (for TriCore) and RTA-OSEK (for TriCore, untested). Within the context of the ARAMiS II project, KESO features such as assisted memory protection and the memory handling from KESO's cooperative memory-management (CMM) framework are currently being implemented in the Astrée static analyzer in cooperation with AbsInt Angewandte Informatik GmbH and the German Aerospace Center (Deutsches Zentrum für Luft- und Raumfahrt (DLR)). It is the first Multi-JVM for deeply embedded systems. It provides OSEK/VDX API calls and system primitives to the (Java) application developer, including service protection which is not provided by OSEK/VDX operating systems. It enables hardware drivers to be written in pure Java. It can detect addressing errors caused by transient hardware faults (i.e., bit flips) without specific hardware support. It provides per domain configurable heap management strategies (garbage collector (GC)): A throughput-optimized, an incremental latency-aware and a fragmentation-tolerant real-time GC variant can be selected during system configuration. Due to comprehensive static analyses, jino generates KESO applications whose resource requirements are comparable to that of applications written in C. Developers of resource-constraint embedded systems can benefit from the use of a modern high-level language and memory protection without the need for dedicated protection hardware. KESO is distributed under the terms of the GNU Lesser General Public License, version 3. KESO is available as a snapshot (2012-06-13). The Documentation area contains various information that should help you getting started with KESO. Stilkerich, Isabella ; Taffner, Philip ; Erhardt, Christoph ; Dietrich, Christian ; Wawersich, Christian ; Stilkerich, Michael: Team Up: Cooperative Memory Management in Embedded Systems. In: ACM (Hrsg.) : Proceedings of the 2014 Conference on Compilers, Architectures and Synthesis for Embedded Systems - CASES'14 (2014 Conference on Compilers, Architectures and Synthesis for Embedded Systems - CASES'14 New Delhi, India October, 2014). 2014, S. Article No. 10. Stilkerich, Michael: Memory Protection at Option - Application-Tailored Memory Safety in Safety-Critical Embedded Systems. Erlangen, Friedrich-Alexander-Universität Erlangen-Nürnberg, Ph.D. thesis, 2012. - 191 pages. Wawersich, Christian Walter Alois: KESO: Konstruktiver Speicherschutz für Eingebettete Systeme. Erlangen, Friedrich-Alexander-Universität Erlangen-Nürnberg, Ph.D. thesis, 2009. - 179 pages. 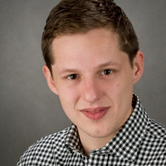 Stilkerich, Isabella: Cooperative Memory Management in Safety-Critical Embedded Systems. 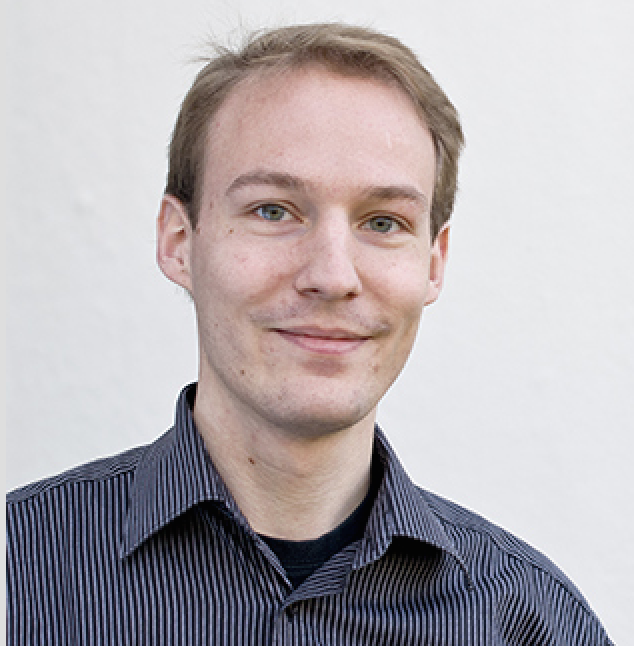 Erlangen, Friedrich-Alexander-Universität Erlangen-Nürnberg, Ph.D. thesis, 2016. - 188 pages.